SEAT has revealed the Juke-rivalling Arona to the public at the 2017 Frankfurt Motor Show. 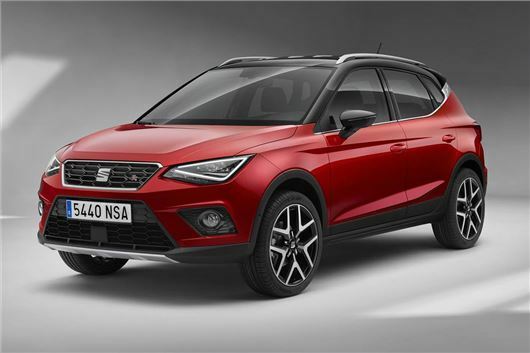 It sits underneath the Ateca in the SEAT range, using the same platform as the all-new Ibiza. It will be available to buy from early 2018 and is expected to cost from around £15,000. Click above to see our video overview. Many of the mechanical components and much of the technology fitted to the Arona will be shared with the new Ibiza. There will be petrol engines with 95PS, 115PS and 150PS, along with a pair of diesels producing either 95PS or 115PS. Manual and DSG auto transmissions will be available. In terms of size the Arona is very slightly longer than the Nissan Juke and Renault Captur – but its 400 litre load capacity is a decent bit larger than the 354 litres in the Nissan and 377 litres for the Captur. If the cabin space in the Ibiza is anything to go by, the Arona should provide more rear leg and headroom than a Juke too. Up front, the similarities with Ibiza continue. The centre stack features the same, driver-facing layout and touchscreen system, with Android Auto and Apple CarPlay connectivity. It’ll be offered with a huge range of high-tech equipment too, including adaptive cruise control, auto emergency brakes, lane keeping assistance and wireless smartphone charging. The trim structure will follow other SEAT models, with S, SE, SE Technology, FR and Xcellence trim levels. The FR variant gets sportier styling and suspension, but other equipment details, as well as pricing information, will be confirmed nearer the car’s on sale date. Note to Mazda - the price list of the comparable Arona starts nearly £3k less than the CX-3 and has a bigger boot, especially on the upper models when the CX-3 loses quite a bit due to the inclusion of the Bose sound system. Mazda - drop your prices otherwise you can't compete with these rivals.